Hitting a milestone birthday is a big deal for many. Some splurge on cars, and others have a right-of-passage party. Not my husband. He requested a guitar cake. That’s right he picked a themed cake over a Lamborghini. Well, not really, but he knew I wasn’t going to get him a car so he settled for the next best thing. A few years ago I made my son a guitar cake which actually was a lot of work and looked, well, mediocre. I opted for a compromise: make a batch of homemade, fudgy, gluten-free brownies, cut them out in shapes of guitars, and decorate them in a pattern that replicates a famous 80’s rock band guitar. 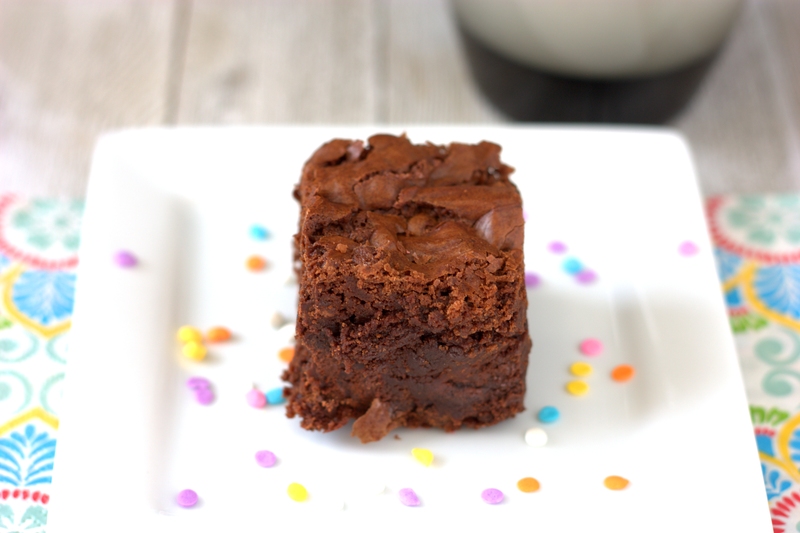 With these two simple changes I solved my problem of soggy brownies, AND I had gluten-free brownies that tasted amazing. With my brownies done it was time to attempt the guitar shape. 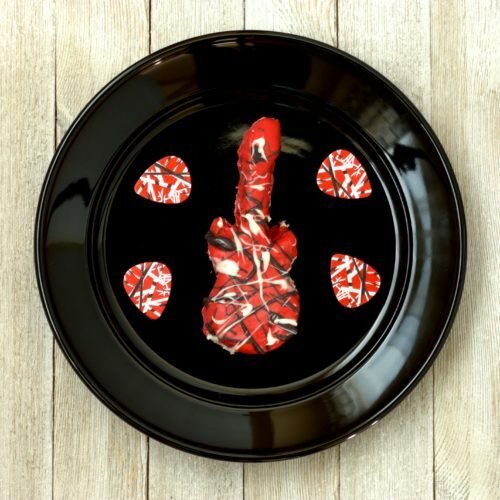 I used a 5-inch long electric guitar cookie cutter and carefully cut out shapes. I placed the shapes on wax paper and then melted candy melts to coat my brownies. I started with red and poured it over the brownie to coat it entirely. Next I melted a bit of black and white candy melts to sprinkle over the top. Finally I trimmed away the excess candy melt and admired my handiwork. 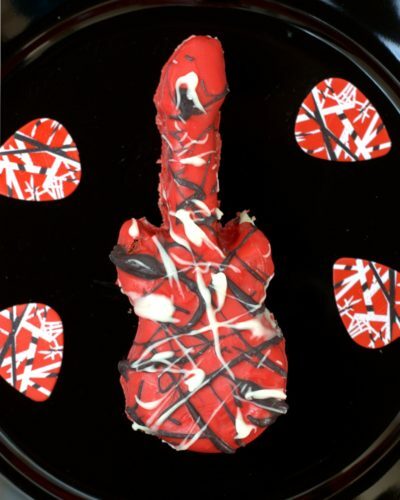 The brownie did in fact mirror the pattern of the famous guitar, as shown by the guitar pics that are decorated in the same pattern. While decorated brownies are only for special occasions in my house, this high altitude gluten-free brownies recipe is my new standard. Preheat the oven to 350°F. Grease an 8×8 baking pan. Place the sugar, butter, and salt in a medium sized saucepan. Heat over medium heat, stirring with a heatproof spatula until the butter melts and the mixture lightens in color. Transfer the mixture to a bowl, add the vanilla and cocoa, and then add the eggs and mix until incorporated. Carefully stir in the flour and the baking powder until well mixed, and then stir in the chocolate chips. Pour the batter into the prepared pan, spreading it to the edges. Bake the brownies for 40-45 minutes, until the top is set and a toothpick inserted in the center comes out clean or nearly so. Remove from the oven and cool completely before cutting. Once the brownies are cool, cover tightly with plastic. This entry was posted in Dessert and tagged birthday, chocolate, gluten-free.